With the departure of Rock Band studio Harmonix a done deal, Viacom is now pulling the plug on publisher MTV Games. MTV Games was originally formed as a division of media conglomerate Viacom to publish the Rock Band series of games made by Harmonix Music Systems, which had itself been purchased by MTV Networks in late 2006. And that was ultimately all it ever did, so when Viacom traded the studio last year for a Red Lobster gift card there just wasn't much left on its plate. It's no big shock in that light that Viacom has decided to close the doors on MTV Games for good. MCV says that the publisher's international office was closed down on February 2 while a "handful of financial staff" are still on the job at the New York location to collect outstanding payments. 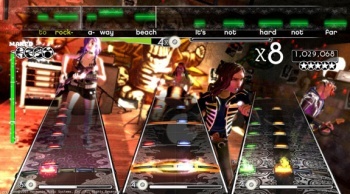 MTV Games dropped $175 million on Harmonix during the peak of the music game rage, after Activision purchased original Guitar Hero publisher RedOctane. But just four years later, the genre crashed harder than an Ozzy Osbourne tour plane; Viacom let Harmonix go for 50 bucks, while Activision closed RedOctane outright in February 2010.